In April 2018, Black Rose/Rosa Negra Anarchist Federation voted to endorse the Palestinian call for Boycott, Divestment, and Sanctions (BDS) against the State of Israel, as well as to join the Campaign in Solidarity with Middle Eastern Political Prisoners organized by the Alliance of Middle Eastern Socialists. To shine a spotlight on the political prisoners who are labor, social justice, feminist, anti-racist and human rights activists opposed to war, imperialism, occupation, authoritarianism, religious fundamentalism and extremism. To oppose all the global and regional imperialist powers in the Middle East: the U.S., Russia, China, Saudi Arabia, Israel, Turkey and Iran. To demand that both state actors and non-state actors responsible for perpetrating war crimes in the Middle East be put on trial. To show that demanding the immediate release of political prisoners in the Middle East is a crucial part of fighting the rise of authoritarianism and racism at home. In this article, we militants from the International Relations Committee (IRC) wish briefly to review and highlight BRRN’s engagement with the objectives and demands of both BDS and the Campaign in Solidarity with Middle Eastern Political Prisoners since our endorsement of them to date. 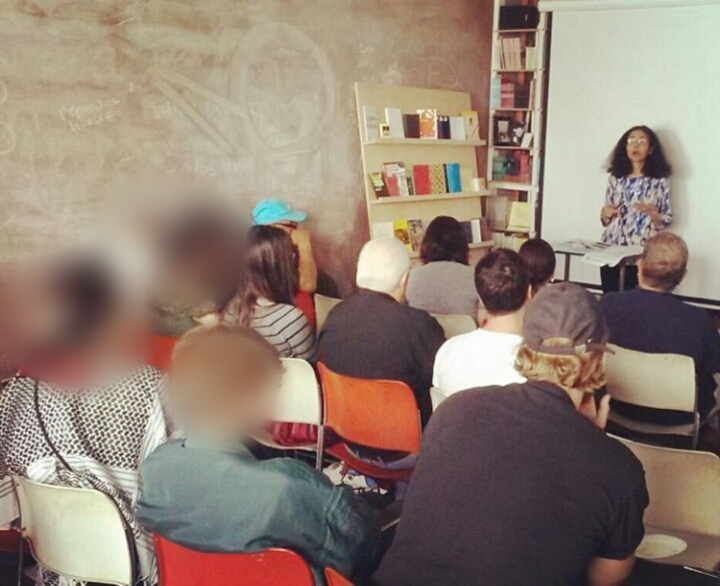 As of this writing, to the Campaign’s first two goals, a panel with comrades from the Palestinian Youth Movement (PYM) and the Alliance of Middle Eastern Socialists was hosted by BRRN-Los Angeles in May 2018. At this event, co-sponsored by the Coalition for Peace, Revolution, and Social Justice (CPRSJ), Razan Ghazzawi spoke to the plight of Syrian prisoners, whereas Celine Qussiny discussed Palestinians prisoners, and Frieda Afary Iranian prisoners. In parallel, as part of our participation in the Campaign, we have also republished Leila Nachawati Rego’s essay on four women icons of the Syrian Revolution—Fadwa Suleiman, May Scaff, Razan Zeitouneh, and Lama Albasha—which was originally published in Spanish in El Diario and then translated into English and republished on Global Voices by Joey Ayoub. Of these four women, three have died, two in exile (Suleiman and Scaff) and one in the detention of Bashar al-Assad’s regime (Albasha). Zeitouneh is missing and presumed killed, together with her comrade Samira al-Khalil and others, who are believed to have been disappeared in December 2013 by the Salafist rebel group, Jaish al-Islam. Additionally, we hope soon to publish an article on the Syrian anarchist Omar Aziz as part of our contribution to the Campaign, and also as part of our biographical series on libertarian-socialist figures. Frieda Afary, from the Alliance of Middle Eastern Socialists, educating an audience hosted by BRRN-Los Angeles about Iranian political prisoners. With regard specifically to the Campaign’s second demand, that of resisting all global and regional imperialist powers in the Middle East, we would direct comrades to our External Education Committee’s recent Twitter thread on “campism”—an approach to international politics that falsely divides the world into “imperialist” and “anti-imperialist” states, effectively giving cover to authoritarian regimes, regardless of their crimes, as long as they are seen as opposing U.S. designs in some limited way. Moreover, a recent panel at Left Coast Forum 2018 that was chaired by a BRRN militant provided critical perspectives on internationalism, imperialism, and the phenomenon of campism, otherwise known as pseudo-anti-imperialism. To the Campaign’s third demand of demanding that war criminals be prosecuted for their atrocities, this is admittedly not something that has advanced, perhaps both because of the hegemony of abolitionism among our membership, but also because of a lack of discussion on this specific point. We hope to discuss this matter soon. As Assad, Vladimir Putin, and the Islamic Republic of Iran face down the last rebel-controlled territory of Idlib province in Syria, where thousands of supporters of the Revolution mobilize against Assad, despite the menace posed by the conventional and chemical weapons possessed by this axis to the largely displaced civilian population of nearly 3 million people in the territory—including about 1 million children—we feel this Campaign to be highly relevant, and we encourage more comrades to get involved. Returning to our engagement with BDS, we published an article, “Gaza Massacre Marks 70 Years of Al-Nakba: We Demand Justice!” on Nakba Day, May 15, 2018, covering the Great March of Return protests and their suppression by the Israeli military. (To learn more about these protests, we highly recommend “Between Fire and Sea,” a documentary about Ahmed Abu Artema, one of the March’s main organizers.) With this intervention, we expressed our support for the first and third goals sought by BDS: an end to Israeli occupation and colonization, as well as observation of the Palestinians’ right to return to the lands from which they have been displaced and ethnically cleansed. Yet beyond this, we face the reality that BRRN as an organization does not have any investments to divest, and, as with the prosecution of suspected war criminals, we have not discussed our position on international sanctions (which are presumably to be enforced by states). While we can boycott commodities produced by labor in Israel (or, more precisely, whose profit is appropriated by Israeli-owned companies), we see our commitment to BDS as mostly symbolic at this time, though we remain committed to respecting the BDS picket line. We would see it as desirable for our student organizing to advance the demand for divestment in the educational sector, and possibly for organizing around the question of the divestment of labor union pension funds in the future along these lines. As with the situation in Syria, it remains necessary to highlight the unprecedented intensification of oppression of the Palestinians at the hands of the Israeli State, which is entirely backed up by the Trump Regime. Whereas the U.S. has for decades consistently supported Israeli expansionism and settler-colonialism, with the falsely progressive Barack Obama negotiating an increase to $3.8 billion in aid to Israel annually by the end of his administration (up from $3 billion per year previously), one struggles to recall such an ultra-reactionary posture among U.S. presidents as that taken up by Trump since taking power in 2017. By appointing the ultra-Zionist settler-sympathizer David Friedman as U.S. ambassador to Israel, recognizing Occupied Jerusalem as the Israeli capital and mandating the move of the U.S. embassy to the city, and delegating the designing of the “deal of the century” between Israel and the Palestinians to his politically inexperienced yet hardline-Zionist real-estate broker son-in-law, Jared Kushner, Trump has greatly bolstered Israeli ultra-nationalism and exacerbated the persecution of Palestinians. It is almost as though Trump were enacting the right-wing Likud Party’s wish-list. Presently, the United States continues to commit outrage after outrage against the Palestinian people. On Monday, September 10th, U.S. National Security Advisor and far-right figure John Bolton ordered the shuttering of the Washington, DC, office of the Palestinian Liberation Organization (PLO), a UN-recognized body representing Palestinians. In effect, Trump has eliminated consular services for Palestinians in the U.S., affecting at least 600,000 Palestinian-Americans. Trump has also expelled the Palestinian ambassador after having revoked his family’s visas. In parallel, Bolton announced that the U.S. would be immediately suspending all contributions made to the UN Relief Works Agency for Palestine Refugees in the Near East (UNRWA), an agency founded in 1949 to provide essential goods and services to Palestinian refugees and their descendants displaced by the creation of Israel. To Trump, this amounts to a ‘savings’ of around $360 million annually, but to UNRWA workers and Palestinian refugees, it signifies considerable hardship. Furthermore, the U.S. let it be known that it was also cutting off $25 million in funding for a network of specialty hospitals in Occupied East Jerusalem serving Palestinian cancer and pediatric patients, among others. Such harsh neo-colonial measures have been designed with the clear intent of provoking despair among the Palestinians and forcing their leadership to ‘accept’ the fundamentally unjust terms being imposed on them by Israel and the U.S. Indeed, Trump’s suspension of all aid to UNRWA in late August follows several months of announced cuts in U.S. contributions to the agency, which themselves were meant to demoralize the Palestinian people. These moves can be considered to represent a direct U.S. war on Palestinian refugees and the Palestinian people as a whole. One especially problematic proposal being floated by the Trump Regime is the redefinition of who “qualifies” as a Palestinian refugee: Trump would like to reduce the number by 90%, from the current 5 million to just 500,000. Such ideas of “demographic engineering” have disturbing echoes with the genocide of the largely Muslim Rohingya minority in Myanmar/Burma, the Bharatiya Janata Party’s (BJP) move to strip four million people of citizenship in India’s Assam State, the proposed land-swap between Kosovo and Serbia which could exacerbate tensions and reignite regional war, the looming forcible repatriation of 5-6 million Syrian refugees from Europe and neighboring Arab countries, and the Assad Regime’s own exterminationist counter-insurgency strategy. Paradoxically, though, the extreme austerity measures and other reactionary policies which the Trump Regime is imposing on the Palestinians reflect its own anxieties: that Bolton expressly framed these aggressive policy changes as retaliation for the Palestinians’ referral of Israel to the International Criminal Court (ICC) for investigation and prosecution for war crimes shows how very threatened the U.S. and Israeli states feel by the possibility of accountability for their numerous atrocities. That Bolton outlined a policy of sanctions against the ICC, if it were to indict any Israeli or U.S. American for violations of international law, demonstrates the significance of holding oppressors to account. From our perspective, we see militating in favor of an arms embargo and academic boycott of Israel, expressing solidarity with Palestinian workers and peasants, and supporting Palestinian resistance to imperialism and settler-colonialism to be pressing priorities at this time.